All those people who love cooking and dining alfresco are aware of the trouble that comes with it. You never have enough space to keep all your plates and food items. However, you don’t need to worry because Suncast Outdoor Prep Station has got your back. It not only helps you to store your supplies but also works as an excellent spot to serve your freshly made meal. Why do you need Suncast Outdoor Prep Station? If you are one of those people who is always longing for trendy and functional accessories to complete the space around them, you need to have this Outdoor Prep Station. This portable prep station will help you to create a beautiful and organized environment. 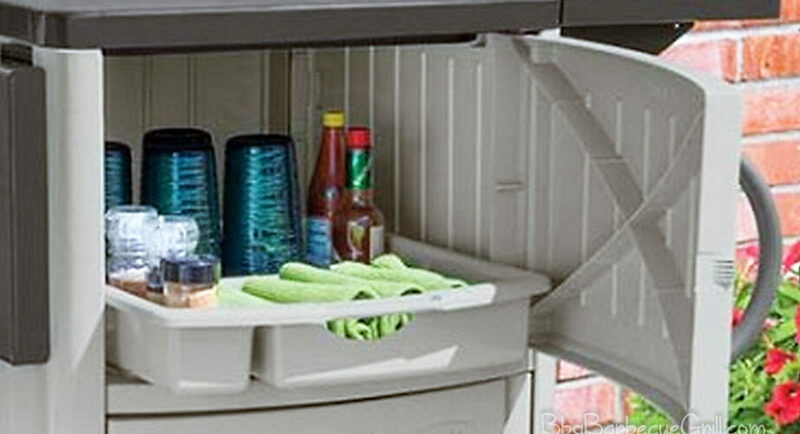 It will give you a dry place for storing your cooking gear and charcoal. This piece is exactly what you need for a prep station next to your grill. Suncast Outdoor Prep Station comes with an adorning and durable design. It has two cabinets. The top cabinet comes with a serving tray that you can bring into the house and load up with everything you need out by the grill. The bottom cabinet can be used to store spices, dressings, platters and grilling accessories. The drop leaf extensions give you extra counter space. These extensions are quite reliable when it comes to bearing weight. One of the users left 20lb of charcoal on top of it for several days without disfiguring the station. It has got 4 casters (2 locking, 2 unlocking) which make it easy to move. The best part is that it is effortless to set up and no tools are required. It is available in Taupe color. The dimensions of the station are 34” deep x 22” long x 20” wide. The 34 inches height includes the wheels as well. It weighs around 29 pounds. It is made out of plastic. The price is quite appropriate considering the quality of the product. The product provides dry storage. Sturdy side leaves provide extra space for serving. Cabinets don’t close properly sometimes. Can’t withstand table-top grill because of the heat. May warp from the sun. The products of Suncast are contriving in the way you set them up. Normally, the instructions are quite easy to understand. You are supposed to follow them. Don’t try to force anything because if it feels like you are forcing something, you are probably going in the wrong direction. The only screws are for attaching the two door handles. Suncast Corporation is a leading manufacturer of stylish, useful and innovative consumer products in the United States. They offer an exciting range of outdoor storage products that makes organizing your backyard or garage a straight forward and stress-free process. If you are planning to create an awesome hosting venue in your outdoor space comprising of all the cool accessories, Suncast Outdoor Prep Station should be on your bucket list. It will help you reorganize and remove the clutter from your surroundings. You can take it along for picnics. I recommend that you should give it a try.